Our next destination was Ithala game reserve. Much smaller in size, but very beautiful landscapes and mountains are very characterises to this park. No Big5 park, but elands, black and white rhinos and elephants. Here Maud had booked us a own camp! http://www.kznwildlife.com/mhlangeni-bush-camp.html which is located in the far end of the park’s main entrance and reception. We checked in at the reseption and the lady told us it would took some 1 to 1.5 hours to drive to the camp. Well, it took a little bit long for us, because we of course took plenty of photos on our way there. Then after pretty long drive on a bumpy gravel roads on the side of the mountains we finally saw our destination down in the valley, and thought it is time for a late lunch and a beer or coke. And the next we saw it! or him, but anyway he was standing just if not on the road, but very next to the road. At the gate there was a sign that advised to leave at least 100 m distance to the elephants. He was probably 20 metres away from the road, eating and enjoying life, without any means to move further. We turned down the engine and waited for him to step away. But no, he just stayed there. After more than half an hour we decided to back up the slope to a hut we had passed a bit earlier, and wait there to get rid of the road block. We thought that the hut was un occupied, but quite soon a young ranger walked to us from the hut asking if we needed something. We explained him that there is an elephant cutting to road to the camp. At first he didn’t understand, an just asked if we want to see the elephants. We told him that no, we have been already seeing the elephant, to close actually. And we would really like to make the last 300 metres to the camp before it gets dark. He said, ok, lets see… I walked with him down to the turn of the road from where we were able to see the situation. He whistled low and said, wow, he is too close to the road and that we could not try to pass him. I told him, yes that’s what Maud has been telling me and Hans, too. We walked slowly towards the ellie, I took photos. Then we obviously got too close to him, and he made a move. I must say I didn’t need the ranger to tell me Run!RUN!run! 🙂 Then more rangers arrived with a car, they managed to drive through the road and the ellie stepped a bit further from the road. So the road was clear! They picked me up and so I drove with them back to Hans&Maud who were waiting at the staff hut. Then we drove with the rangers fast past the elephant and made it to the camp. 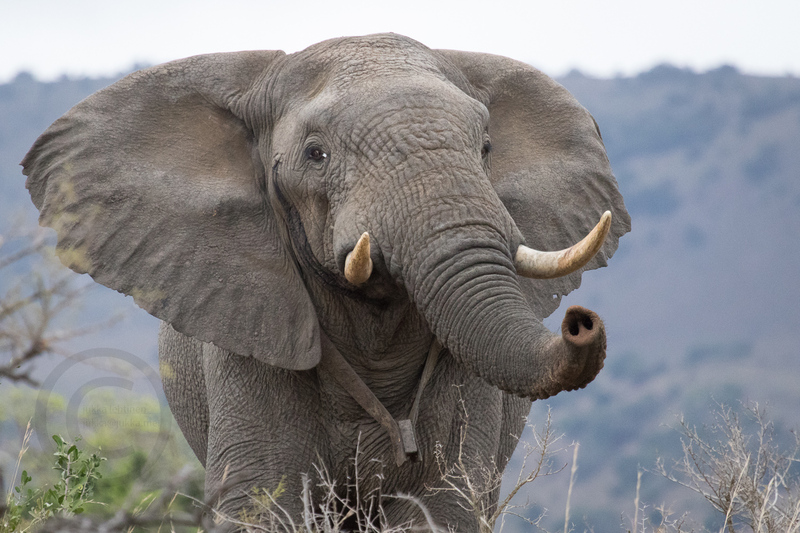 We were relieved and happy to finally get to the camp, when the rangers who had stepped out the car, said to us: ” wait here! we will see if there is an other elephant in the kitchen!” What! an other one in kitchen?! whatta heck?! 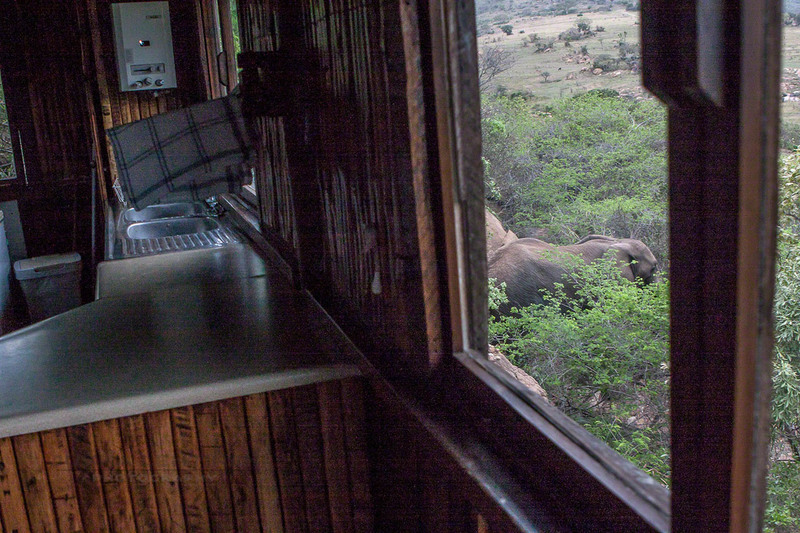 And indeed , literally: there was an elephant, if not IN the kitchen, but next to the kitchen! All the rangers told us was “Get in the room!” and off they drove! The camp is located on a hilltop the kitchen house was in the highest place and the accommodation huts same level or lower down the hill. And there she was eating slowly the trees.